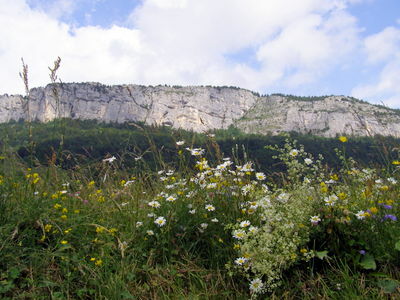 Mont Outhéran is the north-western block of the Chartreuse Massif. Its summit (1673 m) lies a good 300 m below those of the main areas, but it has a fine ridge crowning an impressive set of cliffs. Being somewhat isolated, it offers good views of its more illustrious neighbours, and imposes itself upon the plains to the west and north. The walk described is relatively short (map), but during a leisurely four hours it manages to display to advantage all the features that characterise the best of Chartreuse walking. It is a classic in miniature especially suitable for when the clouds are on the high tops or when you can only manage a short day. It may also be combined conveniently with a visit to the Musée de l'Ours des Cavernes en Chartreuse in Entremont-le-Vieux. The area is also home to one of the massif's few pairs of golden eagles, so you may be rewarded with a glimpse of these magnificent birds. We start from the large car park below the Gite d'Etape above le Désert (1180 m, grid ref: UTM 31T 72383 50387), approached from Entremont-le-Vieux (called Epernay on the IGN map). This lies in a pleasant rural area which in winter is a centre for Nordic skiing. From the car follow the road south for a kilometre (we find it better to tackle the tarmac at the start of the day) to a group of buildings signed les Bruyère, where there is another car park on the left. Leave the road here and follow a path which passes to the right of the auberge into the woods. After 15 minutes, the path crosses a narrow pasture before plunging back into the woods again. The path rises more steeply through these to the Col du Grappillon (1509 m) which is a lovely spot. A forestry track has obliterated much of the traditional path, but some sections may still be followed, providing some light relief. The hard work is now done, and this is where the walk really takes off! Turn right at the col to follow a way-marked path snaking up the ridge through the trees to reach the base of the cliffs after quarter of an hour. The path then follows a terrace to the right for a couple of minutes before ascending easily up some short rocky steps (Difficulty 2) to the ridge, reached within 90 minutes of leaving the car. The arrival point is a pleasant spot from which to admire the view towards the Grand Som, but the summit cross may be found some 300 m along the ridge, and this is a convenient place from which to admire the view and have lunch. The views to the north and east are particularly impressive. A yellow way-marked path now picks its way along the ridge, through a delightful combination of rocky outcrops, small trees, and clearings. It really is an exquisite place. After an hour, the path passes to the right of a hut, and begins to descend - in one area picking its way between a number of open shafts. Fifteen minutes from the hut the path descends more rapidly through the eastern rocky ramparts, with the bottom half being a little messy, before arriving back in the valley. Turning right at a junction with a track returns us to the car within twenty minutes.